Did Alia Bhatt's Father Mahesh Bhatt Really Throw A 'Chappal' At Kangana Ranaut? We don't know what ticked off Kangana Ranaut, but the Manikarnika actress is blowing up Bollywood actors left, right and centre. After speaking up about nepotism and a close-knit industry earlier, the actress claims to have been 'absolutely ignored' by the fraternity. Kangana is known for not mincing her words and the 'take no prisoners' attitude seems to run in her family. Following her sister's footsteps, Kangana's sister Rangoli Chandal (who is also the actress' manager) has made some serious allegations against people in the industry. After Kangana's latest stint when she initiated a verbal attack against Alia Bhatt and Ranbir Kapoor, the actress' sister Rangoli defamed Alia and her mother Soni Razdan for having British passports. She took to Twitter and called them non-Indians who use and abuse the country's resources. 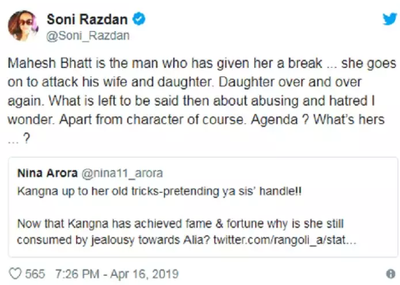 Soni Razdan replied to this accusation via a tweet and mentioned how her husband Mahesh Bhatt gave Kangana a break and yet the actress kept attacking his wife and daughter. After this, the war of words between the Ranaut sisters and the Bhatt family began. 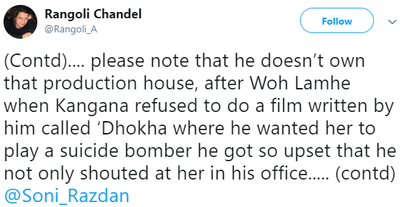 Rangoli went on to reveal that Mahesh Bhatt threw a 'chappal' at Kangana during the screening of Woh Lamhe in 2006 when the actress refused to sign a film with him. Even after this allegation, Rangoli Chandel wasn't done with Alia Bhatt. She made sarcastic comments about Alia's 'exceptional' IQ and having a 'sugar daddy' in the industry. When someone tweeted asking Rangoli if Kangana had taken over her account, she snubbed, "About Kangana taking over my account... I wish someday, we can definitely do a live chat!!! But you guys can't even handle me she will toh set this place on fire." Alia's Highway co-star Randeep Hooda took to Twitter to praise the actress for her performances and at the same time, he subtly called Kangana Ranaut an 'occasional actor' and a 'chronic victim' without mentioning her name directly. Rangoli sure didn't take this standing down. She lashed out at Randeep and accused him of harassing Kangana on the sets of their film Ungli. She even went on to the extent of calling him a 'permanent failure'. Kangana's sister Rangoli seems to be on a mission to stir up controversy. And we're not surprised! From waging a nepotism war against Karan Johar to putting allegations on Hrithik Roshan, Kangana has been known for being ruthless with her coworkers in the industry. So much venom has been spewed in the past by both Kangana and her sister Rangoli that even the people who supported the actress earlier feel that her words lack credibility now.